Please note that guest reviews do not count towards my count of reviews, so we're still two reviews or so away from my 300th. That said, we haven't had a guest review for a few months. We rectify this with, you guessed it, a guest review. 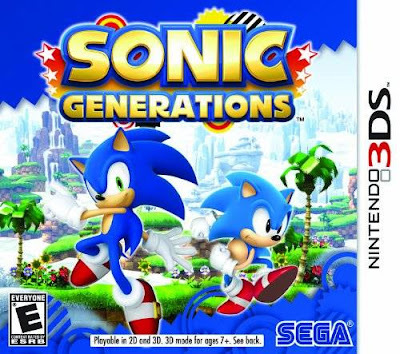 Coming from the mind of my older brother, he takes you through Sonic's first 3DS foray, Sonic Generations. Speaking of brothers, does it live up to its HD relatives? Sonic the Hedgehog has made a rather triumphant return to form in the last couple of years with many of his recent efforts. Sonic Colors, the remastered version of Sonic CD, and the recent PS3 and 360 release of Sonic Generations. It’s the last title we’re going to be focusing on here as it also received a handheld counterpart made by Dimps on the 3DS. The two versions are pretty different all things considered in more ways than you’d think. Does that mean you should invest a little more time into Sonic’s recent time travel story? The game’s story is literally the same as it was in the HD game. A creature’s wreaking havoc on the timeline which sends Sonic into levels from his past. He’s not the only Sonic you have to work with as he’s also joined by his younger and pudgier counterpart from the Genesis days. 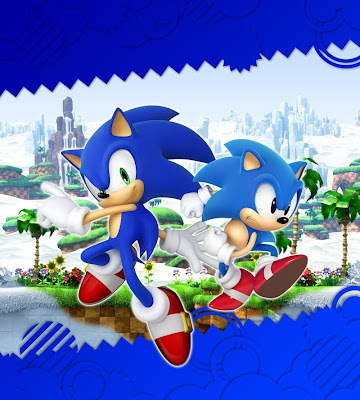 Now while both Classic and Modern Sonic both have their own gameplay styles, the game is almost entirely a 2D affair. Classic Sonic has the spin dash and the more old school style of levels while Modern Sonic has quite a bit of his tricks, most notably the boost and homing attack. That said, as you progress, both Sonics will learn a new move. Have you ever wanted to see the old school style of Sonic learn the homing attack? Even though purists may be offended by this tactic being forced on them as they progress, it doesn’t really matter all that much in the grand scheme of things as both styles are still different enough to make for a varied experience. Once again, the game is divided into three time periods although the levels that you’ll be traversing are nearly completely different from the HD version of the game. The Genesis days bring about Green Hill, Casino Night, and Mushroom Hill, the Dreamcast gets Emerald Coast and Radical Highway, and the modern period gives us levels from Sonic’s DS days in Rush and Colors. Now unlike in the HD version that had parts of stages that would feel familiar, certain levels in the 3DS game are literally just graphically enhanced ports. 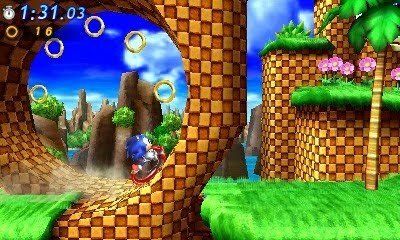 Off the top of my head, Classic Sonic’s first three stages are all the same as they were on the Genesis while Modern Sonic’s Water Palace was a port of the old Rush level. Playing off of nostalgia is fine, but when a fifth of the levels are straight up lifted from other games, that can be a small problem. The good news is that while there are some ripoff stages, the other hedgehog’s version will generally be a new experience altogether. 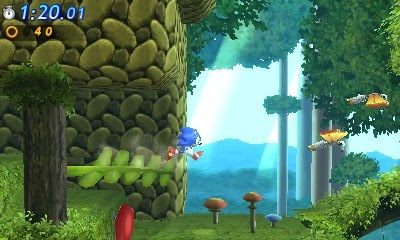 In Mushroom Hill, I was using Modern Sonic’s ability to fly on the propellers to cross deadly gaps whereas Classic Sonic is forced to run from a giant enemy sub in latter half of his Sonic Rush stage. I’m glad that Dimps took the time to add in different scenarios for levels that we never really dealt with in the old games, and for the most part, these tricks work. Also on the positive side for changes are the boss battles. When you clear an era, you’ll unlock a rival race battle against one of Sonic’s old hedgehog nemeses. Beat that, and you’ll open up the real boss fight for the level against foes like Big Arms from Sonic 3 or Biolizard from Adventure 2. I’ll even give props to the final fight for being much more enjoyable than the HD version’s battle was. But with all that said, there are still some problems. As mentioned, the game treads familiar ground a bit too much for my liking. 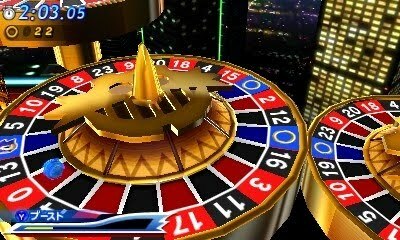 This includes the Sonic Heroes-esque special stages that you’ll automatically open up after clearing both Sonics’ acts in a particular level. Not only does this make collecting the emeralds a bit easier than I’d like, but even if you do screw up on an emerald challenge, you’ll be able to simply go and retry over and over again until you get things right. While I found these areas pretty easy in their own right, these tube chases are just a bit too colorful for my eyes on the condensed screen, making things come out to be a mess. There are also areas in the game that can be a mess, especially when the control style will literally change on the fly. For instance, one section at the very end of Radical Highway will have Sonic hit a spring and then run along the side of the building. While I saw the perspective shift coming, I figured I would be pressing left to run up the wall. Uh-uh. That will kill you. Okay, do I press right then, the button I was holding until I hit the spring? Nope. That kills you, too. Instead, I had to switch to holding up just to keep running forward. It doesn’t help that all you’re doing there is just running forward to hit a ring, but the arbitrary decision to switch up my controls without me knowing in a life or death situation is not something I enjoyed very much. Of course, there’s also the regular problem that comes with many of Dimps’ recent titles. More often than not, their idea of difficulty will be to keep adding more and more bottomless pits as you advance, and I have never particularly enjoyed that design decision. While I enjoy the fact that they use the same orange warning signs to tell me when I’m about to plummet to my demise, I’d much rather just have them tone down on the pits altogether, especially when you have so little time to react before you fall straight into them. Finally, there are other modes for you to enjoy which is a rather good thing as the story mode is also fairly short in this title. There are missions*, an online versus mode, and time attack to go through. I will say that I didn’t bother too much with this as I had already had my fill with the game by the time I reached the end. Still, those of you that enjoy going through Sonic’s titles in depth are going to have a couple of hours added on past the finishing point. Those that don’t will probably only need four hours to go through the story, if that. *SuperPhillip's Note: Missions are unlocked via paying Play Coins or through the 3DS system's StreetPass feature. Even with my mixed take on this title, I still had more fun with Sonic Generations than I didn’t. 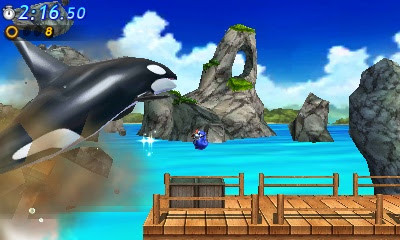 While the 3DS game isn’t even close to the level of its HD counterpart, there’s still a decent amount of fun to be had. In all honesty, this title made me wish that Dimps wasn’t working on lesser versions of titles like they have been in recent years and get to try their hands at a wholly original adventure again as they seem to best when they do their own thing like the Advance or Rush titles instead of make efforts trying to play off of the past, and yes, that’s another shot at Sonic 4. 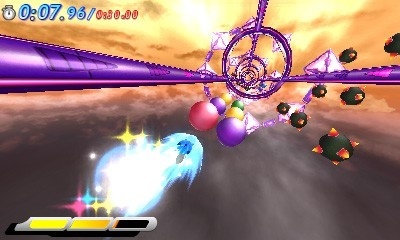 Anyway, if you’re looking for a fast-paced trek through Sonic’s timeline, this game is all right. Just realize that the Blue Blur has seen better days. Haha. My brother thinks this comment is from someone other than me.